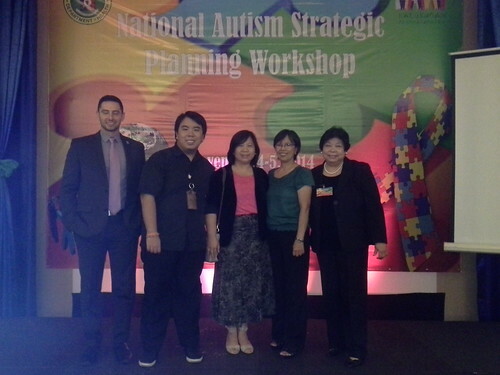 The Department of Health held a National Planning Session on Autism at the Citystate Towers Hotel Malate, Manila last 4-5 November 2014. Assistant Secretary of Health for the Visayas Cluster Dr. Paulyn Ubial gave the synthesis of the Autism Consultative Workshop held in March 2014. There were 4 major areas of concern identified: research policy, planning and program development; medical management including allied professionals; diagnostics; and family and community support. The group also came up with a 3-tiered system of diagnosis: screening by baranggay health worker using PEDS, pediatricians using MChat, and last, developmental pediatricians. As the DOH treads on the path of enginering the the department’s autism agenda, critical to success would be the calibration with the other stakeholders to autism management in the country -- DILG, DSWD, DepEd, developmental pediatricians, allied medical professionals, special educators and concerned DPOs with a large community base like the ASP. The autism community looks forward to improved government funded diagnosis and therapy services for more families in more areas in the country. About the contributor. Cecile Sicam is one of the 11 original founders of the Autism Society Philippines. She has served ASP in many capacities, as President from 2000 to 2004; and as its current Secretary. Ces has been instrumental in the founding of educational non-profits, including Bridges Foundation where she is currently its Directress. Her adult son on the spectrum, Likas, is employed full time as RnB Ice Plant.